Jim Aylward Jr. won a $100,000 prize this week by playing the jersey numbers of Boston Red Sox players, including former Sea Dogs Rafael Devers, Andrew Benintendi and Jackie Bradley Jr.
TEMPLETON, Mass. (USA TODAY) — A Boston Red Sox fan won the lottery this week by playing the jersey numbers of some of the team's best players. 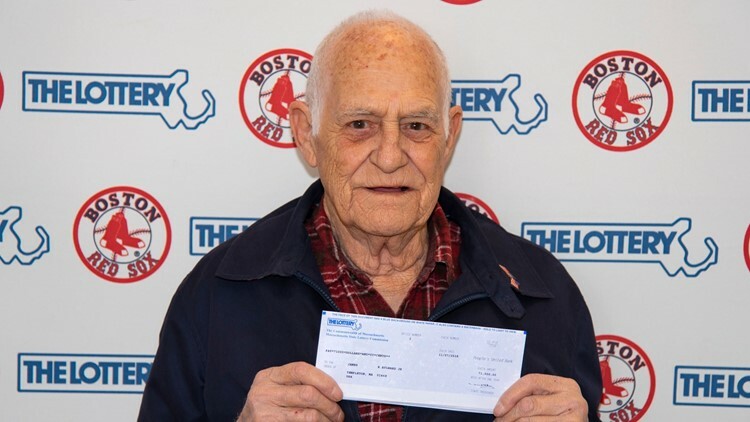 Jim Aylward Jr. of Templeton, Massachusetts won a $100,000 prize in the state's "Mass Cash" game on Monday by playing a combination of jersey numbers belonging to outfielders Andrew Benintendi and Jackie Bradley Jr. and World Series MVP Steve Pearce, among others. Jim Aylward Jr. of Templeton, Massachusetts, won $100,000 from the Massachusetts State Lottery by using Red Sox players' numbers. The Massachusetts State Lottery said in a news release that the winning combination (11-16-19-22-25) represents "the numbers of two young stars, a dazzling outfielder, a starting pitcher and the series MVP." They are the jersey numbers of Rafael Devers, Benintendi, Bradley, Rick Porcello and Pearce, respectively. Aylward, who has five children, nine grandchildren and four great-grandchildren, collected his winnings on Wednesday, according to the release. The Red Sox beat the Los Angeles Dodgers in five games last month to win their fourth World Series title since 2004.